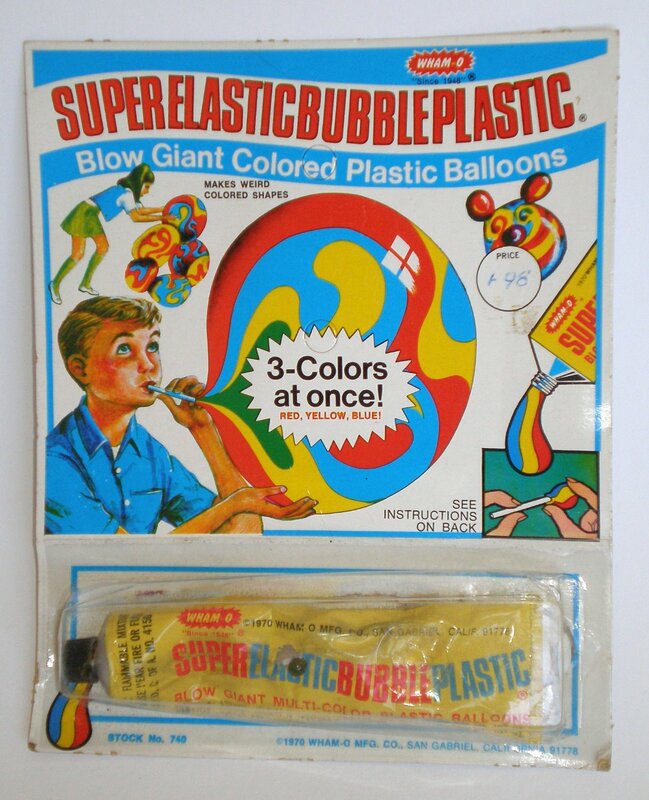 You’ve got to wonder what WHAM-O were thinking when they decided to market a toy to children that was designed to be inflated by mouth, yet was not safe enough to come in to contact with painted surfaces or furniture. (Re-)Introducing SuperElasticBubblePlastic. Basically you squeezed out a blob of this toothpaste-like goop, molded it over the end of a little plastic straw, and blew for all you were worth. 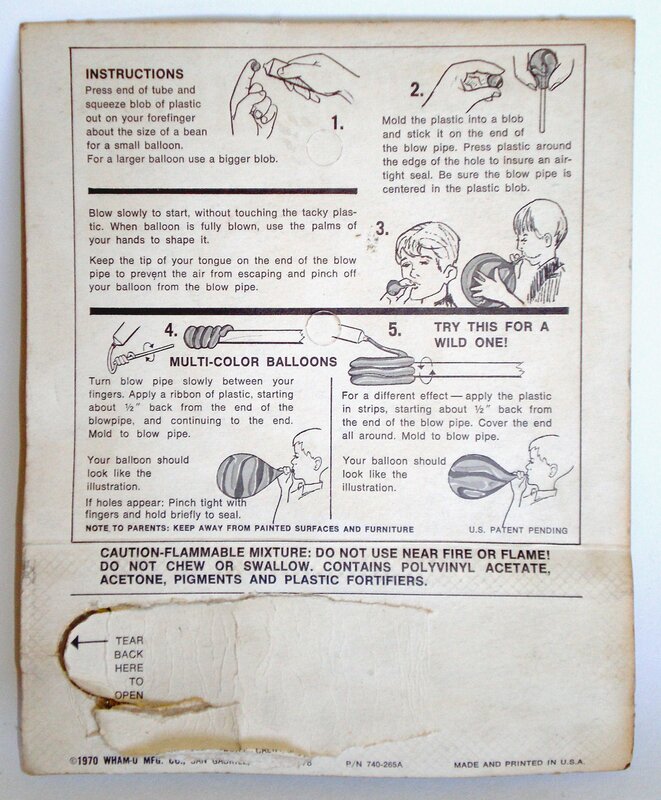 When it worked it was something to see, huge multi-coloured balloons that lasted for as long as a few hours, or until your mum binned it. I often had blow-outs to one side or another however, in theory you could pinch the hole together and keep on puffing, but any engineer knows that once you have a weak spot it’s all over and you may as well start again. 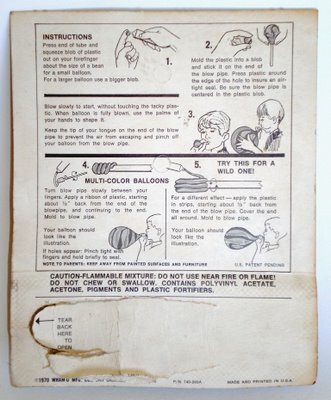 I still remember the distinctive smell of these balloons, somewhere between burnt drinking straws and vomit as I recall. I suppose we must give WHAM-O credit though for pioneering the field of flammable and creatively toxic kid’s toys. Lead paint was for wimps, you knew you were playing in the 70’s when you stuck a cocktail of Polyvinyl Acetate, Acetone, Pigments and Plastic Fortifiers in your little gob. Ahhhh the 70’s. There they are, blast ’em! 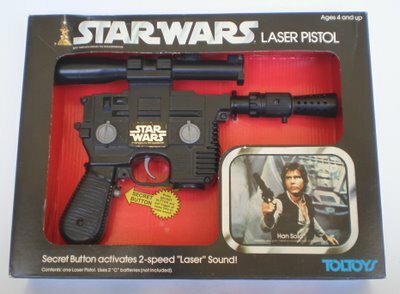 One of the coolest toys produced for the Star Wars license was Han Solo’s blaster, sold as the “Star Wars Laser Pistol” by Kenner in the US and Toltoys here in Australia. This was a top toy, fun sound effects and great feel in the hand. I still recall my disappointment with the flimsy inflatable light saber as a kid, and subsequent envy of the lucky sods running around the playground with one of these. Han Solo was right, ancient weapons are no match for a good blaster at your side. It’s another example of an early release Star Wars toy completely re-branded by Toltoys for the Australian market. They turn up fairly frequently, although not often in good condition. PPS – I’ve added labels to all my previous posts for better navigation, as well as attempting to add an RSS subscription feed so that you can be alerted when a new post appears. Not actually sure if it works yet, it’s the little orange doohickey on the extreme right in the location bar of your browser. I sound so tech it scares me.